Say goodbye to daisy chaining. Announcement after announcement, we’ve all been eagerly awaiting the release of the Sena 30K – and our patience has paid off, it’s finally here. Check out our rundown of the new features and specs down below. 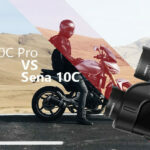 The quick charge feature sounds useful in a pinch but other than these three factors mentioned above and the form factor of the hardware the Sena 20S and the Sena 30k are almost the same. The Sena 30k still has all the features from the 20s and the EVO; I’ll do a quick rundown on each of the features and do a more extensive outline of how Mesh Intercoms works with the 30k. 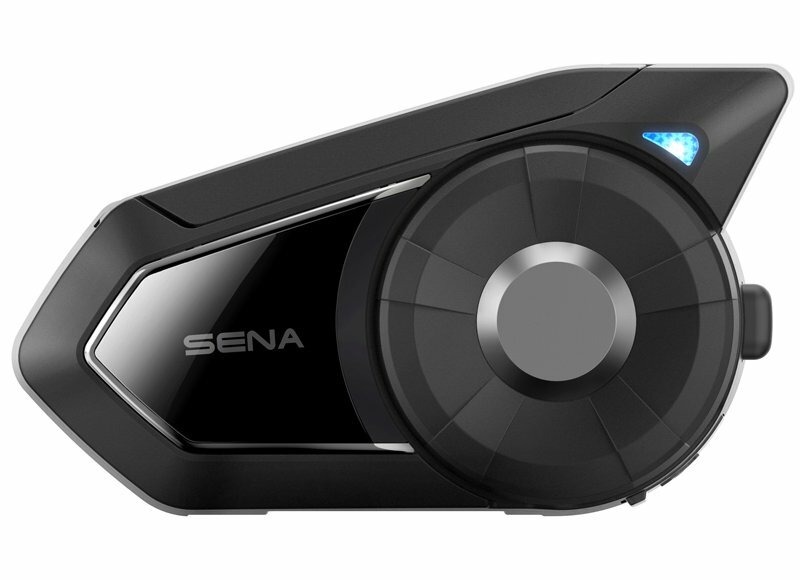 The Sena 30K has standard Bluetooth 4.1 allowing it to connect with almost any other Bluetooth device. 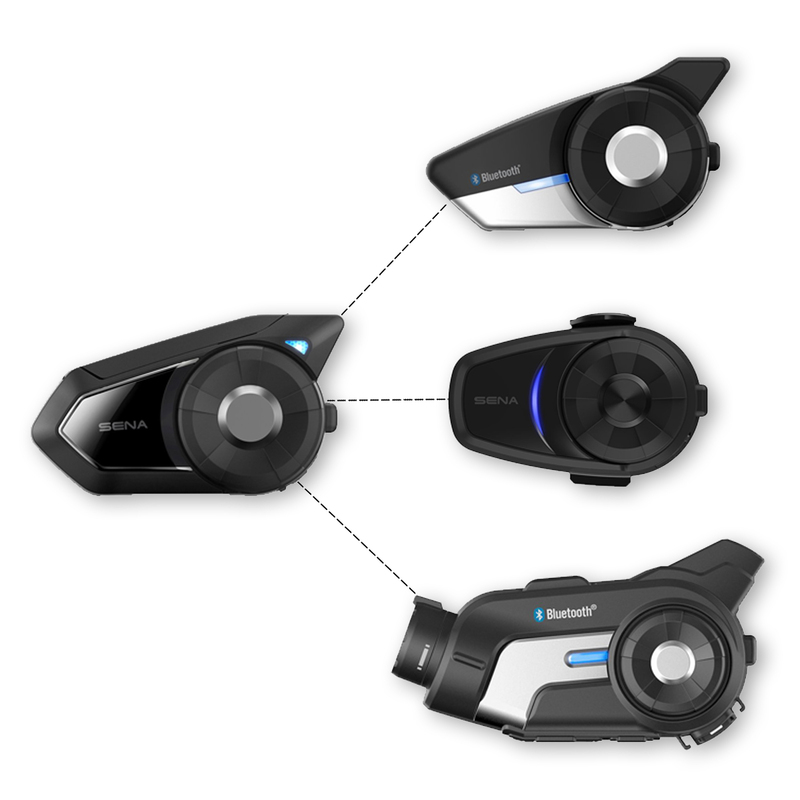 Multi-way - Bluetooth intercom allows you to pair with three other devices all communicating via Bluetooth – it will act as a Multi-Way intercom. This does not work the same way the Mesh network does it’s the original daisy-chaining method. Riders will need to stay in order. For example, in the picture below if Rider D were to disconnect and reconnect ahead of B it would not work they would need to resume their original position. Two-way Intercom – this requires a close range, but you can connect to multiple devices. Though as the name suggests you will only be able to connect to one device at a time. This is used by a group leader if they need to relay individual instructions. This feature allows for a range of options including music sharing during an intercom conversation (you and friend can control the music playback). 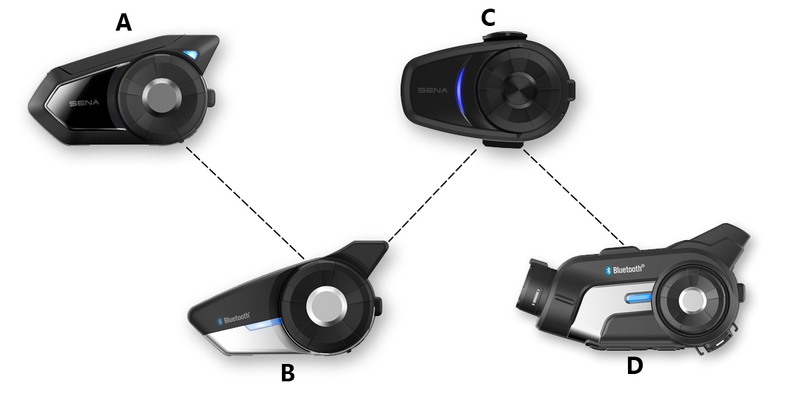 You can also use the headset to adjust volume, skip tracks, boost audio. You can also use the Smart Volume Control feature (Default: disabled) this will regulate the volume based on the environment noise. It has three sensitivity settings low, medium and high, the louder the environmental noise, the higher your 30K will raise the volume to compensate. You can use your Sena 30k to operate a range of primary phone functions. You can: make a call, end a phone call, reject a call or answer a phone call via voice activation (VOX Phone Default: Enabled). 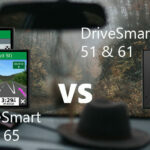 It worth noting that your Phone will take priority unless playing music, for example, if you had a phone call going and were connected to a GPS that was relaying navigational instructions only your phone audio would be heard. 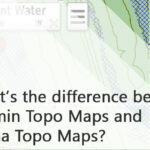 Sena will not communicate the GPS instructions until the phone conversation is over. 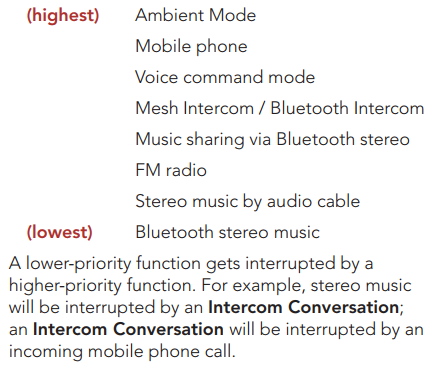 Audio multitasking is always on, while you are on the intercom, receiving GPS instructions will play at a lower volume in the background while an intercom conversation is happening. This can be configured in the Sena app so that you can increase or decrease the background audio. Sena has created a list of the priority order for connected devices. This order shows what functions will be the primary audio and which will be the secondary audio. 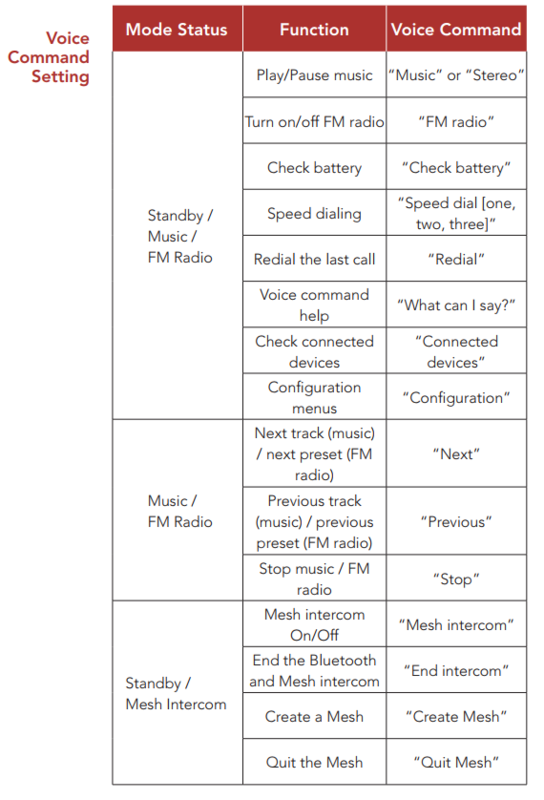 FM Radio functionality on the Sena allows you to move between pre-set radio stations, save radio stations and scan for radio stations. Mesh intercom private mode (closed network between one creator and 15 participants within up to 5 miles. People can join the private mode mesh at any time if the creator accepts their request to join. You can also change the mesh from private to public mode. The mesh will store the information of other users, so the mesh does not need to be re-setup. Also, there is a limitless amount of people that can listen to the group as a ‘guest’ they cannot speak but can listen in. Guest mode comes disabled the creator needs to enable guest mode. The 30k will connect with anyone else with a 30k; it will not store any information about the other headsets meaning anyone can join or leave without disturbing the network. The range for public mode is approximately 1.6km and can handle virtually a limitless number of participants. Public mode is great as you can skip the setup time to get everyone paired, this is ideal for when you meet up with friends during the ride and can instantly connect in with the group conversation. In both modes, there can be a maximum number of 6 people talking at any one time. Do not connect multiple Bluetooth devices to a single 30K each 30K device will get one Bluetooth device which they can bring with them into a mesh network. This summary will be brief, there’s only one reason why you should get the Sena 30k, and that’s the Mesh Network functionality (gasp!). If you don’t do a lot of pack riding, then you can get away with the 20s, 20s EVO or even a 10s. If I have a 30K and my passenger has the 20s, will he/she be able to access the 30K features through linkage with my 30K?